In our lifetime, many of us may face an accident, surgery or illness that requires the use of assistive medical devices. The National Safety Council estimates that more than 25 million Americans slip and fall every year, and 25,000 of these accidents require hospitalization. During recovery, people often need the use of a wheelchair, walker or other assistive medical equipment. When the need for medical equipment arises, most people with health insurance must pay at least a portion of that cost out of their own pockets. For others, there is no insurance at all. Both add to the financial burden of the mounting medical bills and missed work. The Addison Fire District H.E.L.P. program collects, cleans and repairs used medical equipment for short-term loan to those in need. Re-using the equipment creates savings not only for the individuals, but also for the environment. This is a cost-effective program. 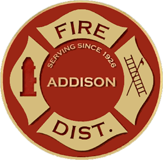 The Addison Fire District does not purchase new equipment. We rely on people no longer needing their equipment to donate it. Then our volunteers or staff help repair and sanitize the equipment. The equipment is loaned and once a patient no longer needs, the individual returns it. The process starts over again. You are recovering from an injury or surgery. You want to try the equipment before buying it. You are waiting for insurance coverage approval. You are ill and uncertain about the period of need. You are a visitor to the area who may not be able to transport your own equipment. How to borrow medical equipment from the Addison Fire District H.E.L.P. Determine what you need, including size, special features, etc. Talk to your doctor or therapist if you have questions on specific needs. Call the number below to inquire about equipment availability and to arrange a time to pick up the equipment. If you have any items that you are willing to donate, please call (630) 628-3100. We will ensure that all donated equipment is safe and clean for reuse. Your donations are tax-deductible and a receipt will be provided. Thank you in advance for your support!